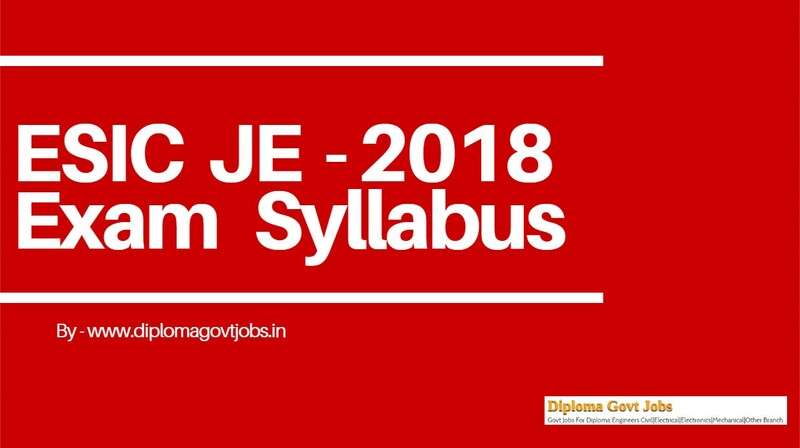 Today We are Going to Provide You ESIC JE 2018 Syllabus and Selection Process for Civil and Electrical Engineering So you could Prepare well for Your Upcoming ESIC JE Exam. The Syllabus for General Intelligence includes questions of both verbal and non-verbal type. The test may include questions on analogies, similarities, differences, space visualization, problem-solving, analysis, judgment, decision making, visual memory, discrimination, observation, relationship concepts, arithmetical reasoning, verbal and figure classification, arithmetical number series etc. The test will also include questions designed to test the candidate’s abilities to deal with abstract ideas and symbols and their relationships, arithmetical computations and other analytical functions. Questions will be aimed at testing the candidate’s general awareness of the environment around him/her and its application to society. Questions will also be designed to test knowledge of current events and of such matters of everyday observations and experience in their scientific aspect as may be expected of any educated person. The test will also include questions relating to India and its neighboring countries especially pertaining to History, Culture, Geography, Economic Scene, General Polity, and Scientific Research, etc. These questions will be such that they do not require a special study of any discipline. i) Building Materials: Physical and Chemical properties, classification, standard tests, uses and manufacture/quarrying of materials e.g. building stones, silicate based materials, cement (Portland), asbestos products, timber, and wood-based products, laminates, bituminous materials, paints, varnishes. ii) Estimating, Costing and Valuation: estimate, the glossary of technical terms, analysis of rates, methods, and unit of measurement, Items of work – earthwork, Brickwork (Modular & Traditional bricks), RCC work, Shuttering, Timber work, Painting, Flooring, Plastering. Boundary wall, Brick building, Water Tank, Septic tank, Bar bending schedule, Centre line method, Mid-section formula, Trapezoidal formula, Simpson‘s rule. The cost estimate of Septic tank, flexible pavements, Tube well, isolates and combined footings, Steel Truss, Piles, and pile caps. Valuation – Value and cost, scrap value, salvage value, assessed value, sinking fund, depreciation and obsolescence, methods of valuation. iii) Surveying : Principles of surveying, measurement of distance, chain surveying, working of prismatic compass, compass traversing, bearings, local attraction, plane table surveying, theodolite traversing, adjustment of theodolite, Leveling, Definition of terms used in leveling, contouring, curvature and refraction corrections, temporary and permanent adjustments of dumpy level, methods of contouring, uses of contour map, tachometric survey, curve setting, earthwork calculation, advanced surveying equipment. iv) Soil Mechanics: Origin of soil, phase diagram, Definitions-void ratio, porosity, the degree of saturation, water content, the specific gravity of soil grains, unit weights, density index and interrelationship of different parameters, Grain size distribution curves and their uses. Index properties of soils, Atterberg‘s limits, ISI soil classification, and plasticity chart. The permeability of soil, coefficient of permeability, determination of the coefficient of permeability, Unconfined and confined aquifers, effective stress, quicksand, consolidation of soils, Principles of consolidation, the degree of consolidation, pre-consolidation pressure, normally consolidated soil, elogp curve, computation of ultimate settlement. Shear strength of soils, direct shear test, Vane shear test, Triaxial test. Soil compaction, Laboratory compaction test, Maximum dry density and optimum moisture content, earth pressure theories, active and passive earth pressures, Bearing capacity of soils, plate load test, standard penetration test. v) Hydraulics: Fluid properties, hydrostatics, measurements of flow, Bernoulli‘s theorem and its application, flow through pipes, flow in open channels, weirs, flumes, spillways, pumps, and turbines. vi) Irrigation Engineering: Definition, necessity, benefits, 2II effects of irrigation, types, and methods of irrigation, Hydrology – Measurement of rainfall, runoff coefficient, rain gauge, losses from precipitation – evaporation, infiltration, etc. Water requirement of crops, duty, delta and base period, Kharif and Rabi Crops, Command area, Time factor, Crop ratio, Overlap allowance, Irrigation efficiencies. Different type of canals, types of canal irrigation, loss of water in canals. Canal lining – types and advantages. Shallow and deep to wells, yield from a well. Weir and barrage, Failure of weirs and permeable foundation, Slit, and Scour, Kennedy‘s theory of critical velocity. Lacey‘s theory of uniform flow. Definition of the flood, causes, and effects, methods of flood control, water logging, preventive measure. Land reclamation, Characteristics of affecting the fertility of soils, purposes, methods, description of land and reclamation processes. Major irrigation projects in India. vii) Transportation Engineering : Highway Engineering – cross sectional elements, geometric design, types of pavements, pavement materials – aggregates and bitumen, different tests, Design of flexible and rigid pavements – Water Bound Macadam (WBM) and Wet Mix Macadam (WMM), Gravel Road, Bituminous construction, Rigid pavement joint, pavement maintenance, Highway drainage, Railway Engineering- Components of permanent way – sleepers, ballast, fixtures and fastening, track geometry, points and crossings, track junction, stations and yards. Traffic Engineering – Different traffic survey, speed-flow-density, and their interrelationships, intersections, and interchanges, traffic signals, traffic operation, traffic signs and markings, road safety. viii) Environmental Engineering: Quality of water, the source of water supply, purification of water, distribution of water, need of sanitation, sewerage systems, circular sewer, oval sewer, sewer appurtenances, sewage treatments. Surface water drainage. Solid waste management – types, effects, engineered management system. Air pollution – pollutants, causes, effects, control. Noise pollution – cause, health effects, control. i) Theory of structures: Elasticity constants, types of beams – determinate and indeterminate, bending moment and shear force diagrams of simply supported, cantilever and over hanging beams. Moment of area and moment of inertia for rectangular & circular sections, bending moment and shear stress for the tee, channel and compound sections, chimneys, dams and retaining walls, eccentric loads, slope deflection of simply supported and cantilever beams, critical load and columns, Torsion of circular section. ii) Concrete Technology : Properties, Advantages and uses of concrete, cement aggregates, importance of water quality, water cement ratio, workability, mix design, storage, batching, mixing, placement, compaction, finishing and curing of concrete, quality control of concrete, hot weather and cold weather concreting, repair and maintenance of concrete structures. iii) RCC Design: RCC beams-flexural strength, shear strength, bond strength, the design of singly reinforced and double reinforced beams, cantilever beams. Tbeams, lintels. One way and two-way slabs, isolated footings. Reinforced brickworks, columns, staircases, retaining wall, water tanks (RCC design questions may be based on both Limit State and Working Stress methods). iv) Steel Design: Steel design and construction of steel columns, beams roof trusses plate girders. The Syllabus for General Intelligence would include questions of both verbal and non-verbal type. The test may include questions on analogies, similarities, differences, space visualization, problem-solving, analysis, judgment, decision making, visual memory, discrimination, observation, relationship concepts, arithmetical reasoning, verbal and figure classification, arithmetical number series etc. The test will also include questions designed to test the candidate’s abilities to deal with abstract ideas and symbols and their relationships, arithmetical computations and other analytical functions. i) Basic concepts Concepts of resistance, inductance, capacitance, and various factors affecting them. Concepts of current, voltage, power, energy and their units. ii) Circuit law Kirchhoff’s law, Simple Circuit solution using network theorems. iii) Magnetic Circuit Concepts of flux, MMF, reluctance, Different kinds of magnetic materials, Magnetic calculations for conductors of different configuration e.g. straight, circular, solenoidal, etc. Electromagnetic induction, self, and mutual induction. iv) AC Fundamentals Instantaneous, peak, R.M.S. and average values of alternating waves, Representation of sinusoidal waveform, simple series and parallel AC Circuits consisting of R.L. and C, Resonance, Tank Circuit. Poly Phase system – star and delta connection, 3 phase power, DC and sinusoidal response of R-Land R-C circuit. v) Measurement and measuring instruments Measurement of power (1 phase and 3 phase, both active and reactive) and energy, 2 wattmeter method of 3 phase power measurement. Measurement of frequency and phase angle. Ammeter and Voltmeter (both moving coil and moving iron type), Extension of range, Wattmeter, Multimeters, Megger, Energy meter AC Bridges. Use of CRO, Signal Generator, CT, PT, and their uses.Earth Fault detection. (a) D.C. Machine – Construction, Basic Principles of D.C. motors and generators, their characteristics, speed control and starting of D.C. Motors. Method of braking motor, Losses, and efficiency of D.C. Machines. (b) 1 phase and 3 phase transformers – Construction, Principles of operation, equivalent circuit, voltage regulation, O.C., and S.C. Tests, Losses and efficiency. Effect of voltage, frequency and waveform on losses. Parallel operation of 1 phase / 3 phase transformers. Autotransformers. (c) 3 phase induction motors, rotating magnetic field, the principle of operation, equivalent circuit, torque-speed characteristics, starting and speed control of 3 phase induction motors. Methods of braking, the effect of voltage and frequency variation on torque-speed characteristics. vii) Synchronous Machines - Generation of 3-phase e.m.f. armature reaction, voltage regulation, parallel operation of two alternators, synchronizing, control of active and reactive power. Starting and applications of synchronous motors. viii) Generation, Transmission and Distribution - Different types of power stations, Load factor, diversity factor, demand factor, cost of generation, inter-connection of power stations. Power factor improvement, various types of tariffs, types of faults, short circuit current for symmetrical faults. Switchgear – rating of circuit breakers, Principles of arc extinction by oil and air, H.R.C. Fuses, Protection against earth leakage / over current, etc. Buchholtz relay, Merz-Price system of protection of generators & transformers, protection of feeders and bus bars. Lightning arresters, various transmission and distribution system, comparison of conductor materials, the efficiency of the different system. Cable – Different type of cables, cable rating and derating factor. ix) Estimation and costing - Estimation of lighting scheme, electric installation of machines and relevant IE rules. Earthing practices and IE Rules. x) Utilization of Electrical Energy - Illumination, Electric heating, Electric welding, Electroplating, Electric drives, and motors. xi) Basic Electronics - Working of various electronic devices e.g. P N Junction diodes, Transistors (NPN and PNP type), BJT and JFET. Simple circuits using these devices. The final selection for the post of Junior Engineer (Civil) and Junior Engineer (Electrical) will be made on the basis of merit position in Written Examination (Computer Based).